We bring back Kombucha at the first of the year to chat about the benefits of good gut health. Many of you may be working on your New Years Resolutions, they may include, Detoxing and better body perception or a more ground emotional outlook. Lucky for you, we are here to help you out! In Jan we have our new Fresh Start Detox Kits that will help to nourish and support you in your new beginnings. Kombucha is a excellent thing to team up with for your detoxing. Kombucha helps to support good gut health. Your Gut is known as your first brain and can really help to support a more grounded emotional approach. If you have ever tried Kombucha your first response may have been, “What the heck was that!” This sour, but sweet bubbly concoction that is good for you often sends a look of confusion to people’s faces with the first sip. Kombucha is a fermented bubbly beverage that has living probiotics in it. For over 2000 years this strange botanical bacteria beverage has been used for gut health, soothing digestion, boosting energy levels, reducing stress and much more. The elders of the Ancient Chinese culture used it as a tonic for reducing inflammation and cancer. Making Kombucha is a fun fermentation skill set to have under your belt. You really only need a few things to get started with your own batch of Kombucha. 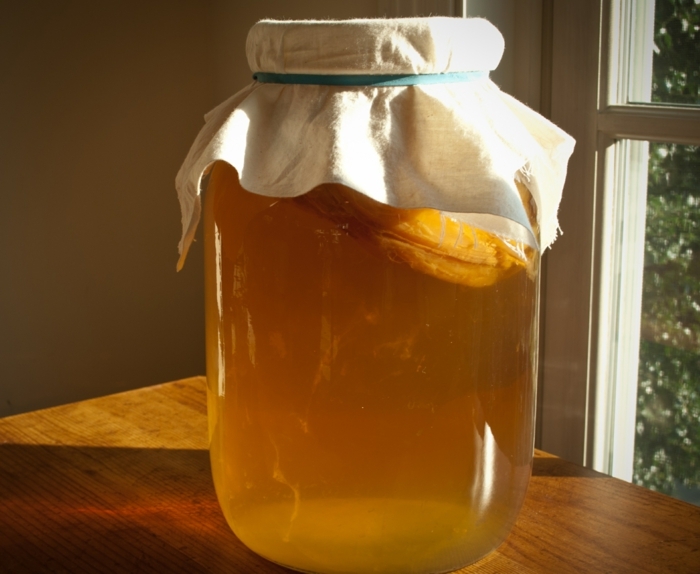 What you will need to get your first batch going is a SCOBY or mother culture, sugar and black tea. Eva’s Herbucha has a great starter kit! The nice thing about making Kombucha is that you can flavor it with most anything. Maybe you like lemon–cayenne, fresh berries or looking for a little more support for emotional imbalances. It only takes a few weeks to make your own batch of Kombucha. This blend will help with to boost your moody winter blues while nourishing your gut health. Watch me live on KGW8 on Jan 30th , at 4pm, for this months product making tip! *Several containers for putting the Kombucha in. (Approximately 1 gallon’s worth). Bring approximately 4 quarts of distilled water to a boil. Pull from heat and add the sugar. Stir with a wooden spoon until it has dissolved. Take the tea and put into the stock pot with the sugar and put the lid on to let steep until the liquid has cooled to room temperature. Once the tea’s cooled then add your SCOBY to the sterile gallon jar and add the tea to the gallon jar. Place a cheese cloth or coffee filter over the top of the gallon jar and seal with a rubber band. Keep it in a dark location at room temperature for 2-4 weeks. The first time you make this I would take a sample each 7 days to understand the difference in sweetness vs sourness. I tend to like mine right around the 14 day period. Label and date. After you achieve your desired bubbly, sour/sweetness, you will need to pour off the liquid into another gallon jar. You will want to leave a little bit of liquid (approx. 1 cup) in the original jar with the SCOBY. You can go ahead and start another batch of Kombucha or leave the SCOBY in a dark place for the next round. Close up the gallon jar with a lid that is not metal. The metal has a tendency to kill the SCOBY. This blend will help to give you a little boost for the winter blues. -Take your second gallon jar with only the Kombucha and no SCOBY. It is time to be creative and add your flavor. -Add all flavor or above ingredients to your gallon and add the cheese cloth and rubber band around the top. Let it sit for another 2-4 days to infuse the Kombucha with the other ingredients. It is important to not add other ingredients to the first fermentation because many things can kill the SCOBY. Label and date. 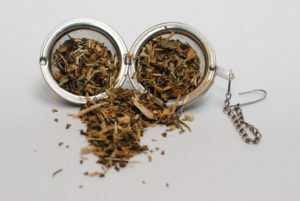 -Strain your other ingredients from the Komucha and bottle up. -Label up your bottles with the ingredients and date. Learning to make your own herbal products is a fun evolution to bringing balance to your life. On your person and in your home. We understand that not everyone likes to make his or her own products. We take great pleasure in creating products and recipes for you. However, if you are interested in going more in depth to make all your own herbal products get signed up for THS Make Your Own: Herbal Product Series, Beginning in March 2019. In this 4 month, hands-on, program we will dive into making an assortment of products for your hair, skin, body and home. Space is limited. Secure your spot today! Early Bird Special $100 off till Mar 1st.